Learn how to get started with PayPal Here to help you successfully manage and grow your business. Not signed up yet? Get PayPal Here. Get started with PayPal Here. Download the PayPal Here app on your iOS or Android device. 2. Set up your business profile. See how to set it up through the app, including customizing receipts. 3. Get reader and connect. 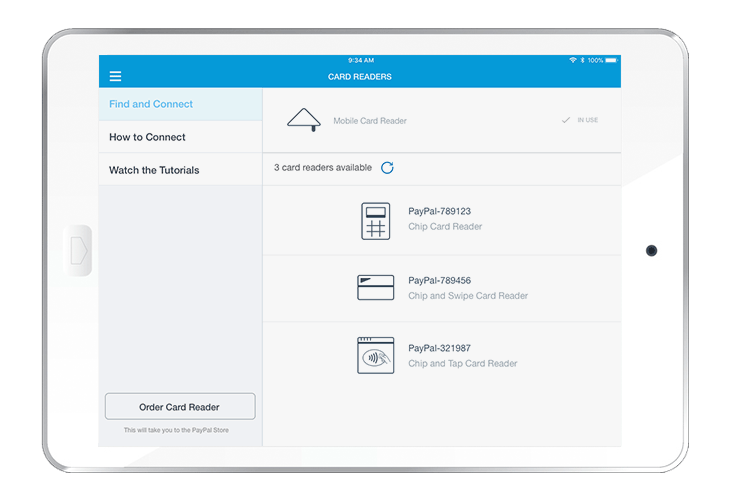 Sign into the PayPal Here app to verify your address, and select a card reader from the menu. Visit our webstore to order your preferred card reader online. Once set up, you can easily transfer your funds from your PayPal account to your bank account. For same-day access to your funds, apply for the PayPal Business Debit Mastercard®. Customize your business profile and receipts. Help minimize customer chargebacks by stating your return policy and creating a recognizable card statement name for your business. Use the app or log into PayPal on your desktop to manage and categorize your inventory list and upload photos. Add up to 1,000 users to one account, all with separate passwords and access levels. Run customized sales reports by date, salesperson, items, and more—all in a couple of taps. Get to know our readers. *Key-in transactions and sales over $500 in a 7-day period made with the Mobile Card Reader are subject to an automatic 30-day reserve where funds are held in your PayPal account to cover the high risk associated with these types of transactions. For increased protection from fraudulent transactions, we recommend using a chip card reader. All PayPal accounts are subject to policies that can lead to account restrictions in the form of holds, limitations, or reserves. Additional information about these policies can be found in the PayPal User Agreement. Apple Pay is a trademark of Apple Inc., registered in the U.S. and other countries. Samsung Pay is a registered trademark of Samsung Electronics Co., Ltd. Complete your point-of-sale setup with these partner accessories. Lockable tablet enclosures increase ease of use and help provide security. Provide your customers with fast and professional-looking printed receipts. Simple solutions to mount, carry, and help protect your card reader. A cash drawer will help making change easy and help keep your money safe. With PayPal Here, you have access to helpful business tools that allow you to manage your business with ease. You can set up PayPal Here to calculate tax on all sales according to your local tax rates using your online merchant account. Or, you can set up taxes using the app. When the Tips feature is on, it’s simple to add gratuity to any transaction, and you can even include suggested tips to simplify the process for your customers. When you turn on the Discount feature using the PayPal Here app, you can apply discounts during checkout with ease. Need a quick tutorial on how to set up your account? Watch now. PayPal Here also makes it easy to streamline your business behind the scenes. You can manage your inventory simply on your phone, tablet, or desktop and simplify inventory management like adding, editing, and deleting inventory on your phone. Your staff or volunteers can take payment with PayPal Here—and all sales will appear in one place, through your PayPal account. You can set up and customize permissions online or by using the app. Use PayPal Here to run reports summarizing your sales transactions by date, user, payment type, or item. You can also email yourself a copy of the report. How to refund a sale. Tap the Settings icon and choose Sales Activity. Then tap Sales History. Find the transaction you want to refund, tap it, and select Refund. You can refund the entire amount or just part of it. You can print a receipt or send confirmation to your customer via text or email. See what else we can do for your business. Learn more about the products and features that come loaded with your PayPal Business account. Visit the Help Center to check our PayPal Here FAQs or ask the PayPal community. Troubleshoot directly from the PayPal Here app on your compatible smartphone or tablet. Reach out to our Customer Support team for live help at 1-877-569-1136.